This disclosure data has been published on the net and we feel that it is appropriate for our company as well. GLOBAL CG GROUP . is committed to a continuing program of product improvement. Thus, please be advised that specifications, performance, parameters, appearance, and dimensions of GLOBAL CG GROUP products are subject to change without notice. For more up-to-date information about GLOBAL CG GROUP products, contact GLOBAL CG GROUP at sales@shredderhotline.com or visit our web site at www.shredderhotline.com™, or your local Global Sales Representative. The information (including performance parameters) provided about GLOBAL CG GROUP products is based on tests conducted by or for GLOBAL CG GROUP by its customers under various controlled and non controlled conditions, and is intended for comparison and general information purposes only. Since the condition of actual use may vary and are beyond GLOBAL CG GROUPs control, we cannot guarantee the same results will be obtained under different conditions. You should discuss which GLOBAL CG GROUP which products would be appropriate for your application by contacting GLOBAL CG GROUP, or your local Sales Representative. Privacy Statement GLOBAL CG GROUP provides an interactive web site environment on the Internet to enable Customers, Potential Customers, Employees, and Other Relevant Parties to find, use and share the information they need to perform their functions better and more efficiently. We recognize and support the need to protect the privacy rights of our users through disclosure of our practices for data collection and use of that information. You can visit www.shredderhotline.com™ at any time without telling us who you are or revealing any information about yourself. However, we may log the IP address, type of operating system and browser software used by each visitor, and from this information we can derive the identity of the visitor's geographic location and Internet Service Provider. We use this data in aggregate form to build a higher quality, more useful site by analyzing the collective characteristics of our users and measuring usage of each area of our site. Please note, we may ask you to provide certain personal information (e.g. name, company name, title, email address, etc.) when you register in some sections of the site. We use this registration process as a means to maintain security of this particular section of the site. Contact information is also used to get in touch with the user when necessary. We do not use personal identifying information for any reason that is not disclosed either in this Statement or at the time the information is requested. "Cookies" Global's web site does NOT utilize "cookies" technology to track activities on the site. Disclosure to Third Parties: We do not share personal identifying information with any third party. Third Party Links to Global's site may contains links to other Internet sites. We require or encourage all of our partners, contributors, and third parties to implement policies and practices that respect the privacy of our users. However, GLOBAL CG GROUP is not responsible for the privacy practices or the content of such web sites. Please note that we do review our Privacy Statement from time to time, and that it is subject to change without notice. We ask that our users periodically review this page to ensure familiarity with the most current version of our Privacy Statement. If you have any questions or comments, please feel free to contact us. GLOBAL CG GROUP COPY RIGHT NOTICES Copyright 1966-2006, GLOBAL CG GROUP All rights reserved. Unless otherwise specified, this service and its content are owned by GLOBAL CG GROUP and/or third party licensors and are protected by the United States Copyright Act of 1976, as amended, and the copyright laws of other countries. Certain materials are used by permission of their respective owners. The content of this service, including graphic images, buttons, and text, may not be copied, reproduced, republished, uploaded, posted, transmitted, or distributed in any way, without the prior written permission of GLOBAL CG GROUP except that you may download, display, or print one copy of the materials on any single computer solely for your personal, non-commercial, home use, provided that you keep intact all copyright, trademark and other proprietary notices. Modification of the materials or use of the materials for any other purpose is a violation of GLOBAL CG GROUP and/or its third party information providers' copyrights and other proprietary rights. Nothing contained herein shall be construed as conferring by implication, or otherwise, any license or right under any copyright, patent, trademark, or other proprietary interest of GLOBAL CG GROUP, its affiliates or any third party. TRADEMARKS, GLOBAL CG GROUP, Global Shredder(s), Burda, Burda Group, Burda Group Shredder(s), Eidal International, Eidal™, Eidal Shredder(s)™, Shredding Systems International, Saturno, Saturno Shredder(s), Chipmaster, Grindmaster, Shredmaster, Splitmaster, Duerr, Duerr Chipper, Duerr Log Splitter, OPP, OPP Chipper, OPP Log Splitter, Cougar, Cougar Chipper, Machete, Machete Chipper, Yaxi, Yaxi Grinder, Yangcheng, Yangcheng Chipper, Global Mauler, Eidal Mauler, Tracor, Tracor Marksman, Tracor Marksman Grinder, burda-group.com, shredderhotline.com™ and other internet domain names registered under ownership of Dan Burda and GLOBAL CG GROUP ( i.e. 165 Domain Names found under the xxxshredders.com or the xxxhotline.com group and outlined at Buydomains.com ) and the intenet search names Weima, Vecoplan, Morbark and Powerscreen under the Yahoo Search Engine Ranking 1, 2 or 3, are trademarks and service marks owned by GLOBAL CG GROUP. 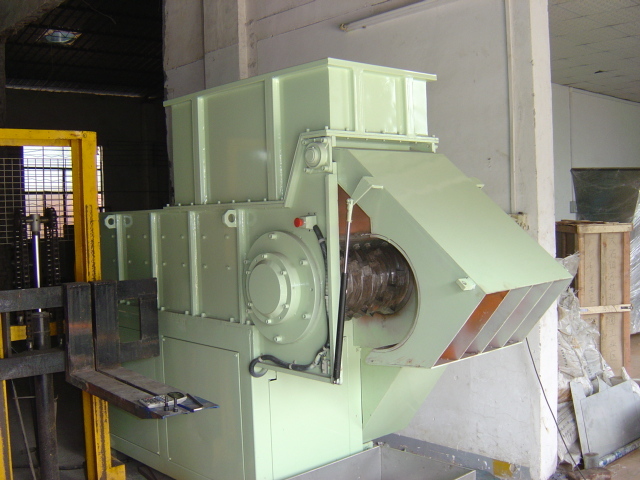 Certain other trademarks used in connection with this Site and service belong to their respective owners, such as Saturn, Shred Pax, SSI, Shred Tech, Komar, and other brands involved in the shredder crusher and pulverizer field or the recycling equipment field. DISCLAIMER OF WARRANTIES, GLOBAL CG GROUP AND ITS AFFILIATES AND SUPPLIERS INTEND FOR THE INFORMATION CONTAINED IN THIS SITE AND THE SERVICES TO BE ACCURATE AND RELIABLE; HOWEVER, ERRORS SOMETIMES OCCUR. THIS SITE IS PROVIDED "AS IS". GLOBAL CG GROUP, ITS OWNERS, OFFICERS, DIRECTORS, EMPLOYEES, AGENTS, AND ANY THIRD PARTY ENGAGED IN THE PROVISION OF ANY PORTION OF THE SITE, DISCLAIM ANY WARRANTY OF ANY KIND, WHETHER EXPRESS OR IMPLIED, AS TO ANY MATTER WHATSOEVER RELATING TO THIS SITE, INCLUDING WITHOUT LIMITATION THE IMPLIED WARRANTIES OF MERCHANTABILITY, FITNESS FOR A PARTICULAR PURPOSE AND NONINFRINGEMENT. USE OF THIS SITE IS AT YOUR OWN RISK. GLOBAL CG GROUP, ITS OWNERS, OFFICERS, DIRECTORS, EMPLOYEES, AGENTS, AND ANY THIRD PARTY ENGAGED IN THE PROVISION OF ANY PORTION OF THE SITE, ARE NOT LIABLE FOR DAMAGES OR INJURY CAUSED BY ANY PERFORMANCE, FAILURE OF PERFORMANCE, ERROR, OMISSION, INTERRUPTION, DELETION, DEFECT, DELAY IN OPERATION OR TRANSMISSION, COMPUTER VIRUS, COMMUNICATIONS FAILURE, THEFT OR DESTRUCTION OR UNAUTHORIZED ACCESS TO, ALTERATION OF, OR USE OF INFORMATION, WHETHER RESULTING IN WHOLE OR IN PART, FROM BREACH OF CONTRACT, TORTUOUS BEHAVIOR, NEGLIGENCE OR OTHERWISE. SOME JURISDICTIONS DO NOT ALLOW THE EXCLUSION OF IMPLIED WARRANTIES, SO THE ABOVE EXCLUSION MAY NOT APPLY TO YOU.LIMITATION OF LIABILITYIN NO EVENT WILL GLOBAL CG GROUP, ITS OWNERS, OFFICERS, DIRECTORS, EMPLOYEES, AGENTS, OR ANY THIRD PARTY ENGAGED IN THE PROVISION OF ANY PORTION OF THE SITE, BE LIABLE FOR ANY DAMAGES, INCLUDING WITHOUT LIMITATION, INCIDENTAL, CONSEQUENTIAL, SPECIAL DAMAGES OR DAMAGES RESULTING FROM LOST DATA, LOST BUSINESS OR BUSINESS INTERRUPTION, IN CONNECTION WITH YOUR USE OR INABILITY TO USE THE SITE, WHETHER BASED ON WARRANTY, CONTRACT, TORT OR ANY OTHER LEGAL THEORY AND WHETHER OR NOT WE HAVE BEEN ADVISED OF THE POSSIBILITY OF SUCH DAMAGES. THE TOTAL LIABILITY OF GLOBAL CG GROUP TO YOU FOR ANY REASON WHATSOEVER SHALL NOT EXCEED THE 1% OF THE FEE PAID BY YOU WITHIN THE SIX MONTH PERIOD PRIOR TO THE TIME THE CLAIM AROSE. Links to other Internet services and sites are provided for the convenience of users. A link to a service or site outside of the aecinternet.com site is not an endorsement of the service or site, its content, or its sponsoring organization.